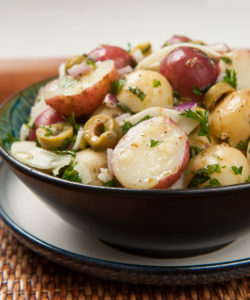 This super-easy potato salad works as either a make-ahead side dish for dinner, or something you can take to a potluck dinner. It’s also packable for school lunches. Bonus: This salad is high in fibre and potassium. Place potatoes and rosemary sprigs in a pot of water and bring to a boil. Cook until tender, about 18 to 20 minutes. Run them under cold water for about 30 seconds, let drain and cool for about 10 minutes. Discard rosemary stems and cut potatoes in half. In the meantime, add fennel, red onions, fresh herbs and olives to a large bowl. Toss with the cooked potatoes. Whisk together all dressing ingredients in a small bowl or measuring cup. Pour dressing over potato-herb mixture and toss gently to evenly coat. Let stand for at least 20 to 30 minutes to absorb flavours before serving. Toss again before serving. Note: To make ahead, boil the potatoes the day before and refrigerate until they’re ready to be dressed.